HomeHeadlinePhotoshop Phil makes sure he gets in on the act! A FERMANAGH Assembly member has accused a government department of excluding Catholics from a shared sports facility in Maguiresbridge after claiming no one from a nationalist background was invited to the launch of a multi-million pound project. Photoshop Phil makes sure he gets in on the act! Phil Flanagan photoshop at the launch of a multi-million pound sports facility. The alleged snub prompted Sinn Fein MLA Phil Flanagan to photoshop himself into an official photograph that was taken by the Department of Social Development (DSD) and included local Unionist representatives Arlene Foster, Tom Elliott and Paul Robinson. 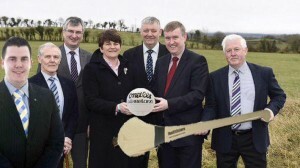 The Sinn Fein member also photoshopped an O’Neill’s gaelic football and an outsized hurling stick in to the image. He shared the photograph on his blog, Dearcadh Eile, Irish for ‘another view’, last week. The DSD minister, Mervyn Storey MLA, launched the multi-million shared sports facility pilot during a visit to Maguiresbridge Loyal Orange Lodge (LOL). The new Regional Shared Sports Facility pilot programme, which will see an estimated investment of £2.5million, aims to support the development of facilities that will enable “divided and isolated communities” to establish new “friendly relations”, it claimed. Seven new sports pitches, four at Orange Lodge grounds and three at GAA grounds, will be provided at various locations across the North. The funding for the pilot projects is Maguiresbridge Orange Lodge, new 3G pitch at a cost £284,222 and Fivemiletown District and Cultural Association, (Roughan) new 3G pitch at a cost of £290,406. Maguiresbridge LOL is the first group to receive funding. Phil Flanagan stated: “The Orange Order has been given money to develop a sports complex in Maguiresbridge and it’s quite obvious that some people won’t be welcome at it. “When they exclude one section form the launch it’s not a very good start. The fact that other MLAs and councillors were invited but the largest party in the area were excluded sends out a very poor message. “It’s being sold as a shared facility but the event to launch it certainly wasn’t shared. It was very much an exclusive event among members of the Unionist community. Maybe they’re sending out a message that Catholics or Nationalists are not welcome to use this facility. “If I had been invited and available to go I certainly would have went. The development of sporting facilities in Fermanagh is an issue I have a great interest in and something I want see more of. But it needs to be done in an inclusive manner, especially when funding has been given to non-sporting organisations. I didn’t know the Orange Order had a history in sports development in the county. But UUP MLA Tom Elliott dismissed the photo as “pathetic”. He added: “It’s a DSD project, so obviously it’s their issue. I was asked because I had given some assistance during the planning stage to discuss different issues of concerns. But trying to photoshop yourself in aspects of gaelic is petty stuff and small minded. “It’s just childish work and I haven’t seen it but I can imagine it. It’s not something you would expect from an MLA. The DSD funding of £284,000 will help towards the construction of a new pitch and include fencing, a footpath and floodlights to facilitate night time use.